South Suburban Savings: Get $30 Worth of Flowers & Gifts From FTD for $15!-- 25,000 Already Sold! 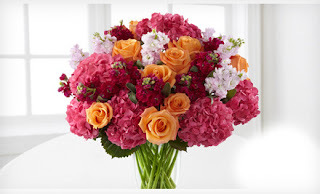 Get $30 Worth of Flowers & Gifts From FTD for $15!-- 25,000 Already Sold! Any birthdays coming up for a special someone? Or maybe there is an upcoming anniversary and other special occasion to celebrate in the next few months? Just want to send a special surprise to your significant other, mom, friend, or sister? Head over to Groupon, and you can get a $30 voucher good for anything on Ftd.com for just $15! Your voucher will be valid through 4/11/14 so you can use it for any special occasion in the next few months :) PLUS, it looks like you CAN use the voucher with special offers & discounts shown on FTD.com at time of redemption (just not email offers)! Awesome! 25,000 have already been sold so be sure to get yours ASAP if you're interested! !